It was only a matter of time before another young adult book franchise took a shot at the fame of “Twilight.” Fortunately, the latest series, “The Hunger Games,” is nowhere near as frivolous as Stephenie Meyer’s vampire angst-fest. For all 2% of you who haven’t read at least the first book, the story follows Katniss Everdeen, a skilled hunter from the impoverished District 12. Each year, Panem (what remains of North America) collects tributes from each district to compete in a fight-to-the-death tournament called the Hunger Games. After her sister is chosen to be one of these tributes (read: corpse), Katniss volunteers herself. This is where the story really takes off. I’m going to try to do my best to give a review on both how good of a film this is as well as how faithful of an adaptation I believe it to be. Something for everyone. 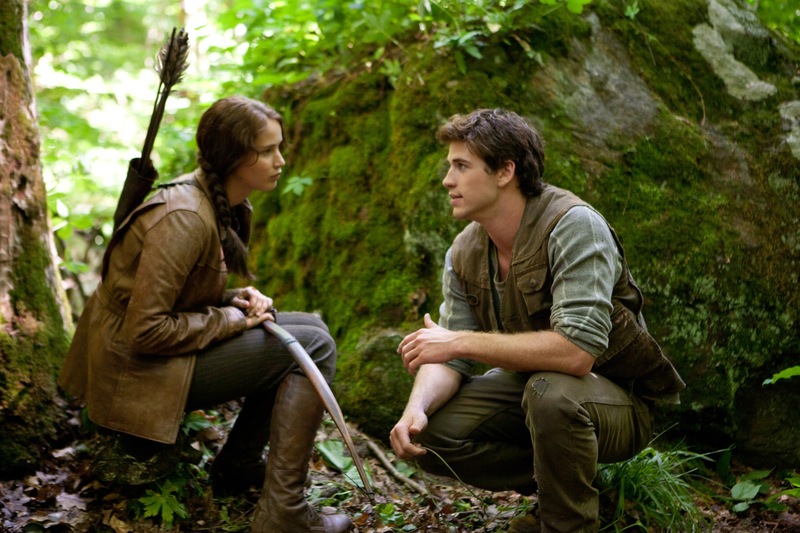 As a film, “The Hunger Games” is an interesting thriller at times and noticeably well put together. There is action and danger for the guys and enough romance to make some girls think it’s actually a chick flick. Director Gary Ross puts together a quality flick despite having been out of the directing chair for nearly ten years. It doesn’t have the signature that a Tim Burton or David Fincher type might bring, but it works as a blockbuster. I’ve been a fan of Jennifer Lawrence since watching “Winter’s Bone” last year and couldn’t help comparing her character in this film to that. Katniss Everdeen isn’t a character that I would trust to just any young actress but Lawrence is very competent in the role and it’s a good portrayal for loyal readers. Most of the supporting cast is also top notch with notable performance by Elizabeth Banks, Woody Harrelson and (of all people) Lenny Kravitz. If I were to make any gripes about the film, the first would be the use of shaky cam. Turns out, it’s just as annoying as it was the first time it was used. I’m all for adding a component to amp up the film or make it feel more like I’m there, but I also don’t like headaches. Two reasons why it was probably added here are A) the previously mentioned “reality” effect and B) to make some of the violence less appalling for younger viewers. Regardless, it detracted from the games. There also could have been more fleshing out of the characters. Rue, in particular, could have used another scene. This leads me to gripes concerning the adaptation of the book. The film failed to mention the significance of the mockingjay. Yes, it’s Katniss’ pin, but it stands for even more. I’m okay with the exclusion of the Madge character, but when the trilogy’s finale is called “Mockingjay,” it’d be nice if people knew the association. Secondly, Peeta was poorly adapted from the book. Josh Hutcherson does better than I would’ve thought with the material, but I would have liked a few more lines from the book and more growth with his character. Lastly, and it really is a minor point, I thought the Careers too closely resembled teenage campers you see at the beginning of a horror movie. The arrogance was there for sure, but they were too relaxed and buddy buddy with each other. They were going to have to kill each other after all. These few gripes aside, “The Hunger Games” was both a good adaptation as well as a worthy sci-fi action film. We can’t always get every detail from the book included, but that doesn’t mean you can’t enjoy the rest of an adaptation. I’m happy to report, however, that it is one of the select few remakes that actually holds water. Starring Channing Tatum and Jonah Hill, the film is about two young police officers who are recruited to join a high school infiltration unit after a hysterically blown arrest deems them too immature for regular police work. This is the second directing job for duo Phil Lord and Chris Miller whose only previous film together was the animated “Cloudy with a Chance of Meatballs” (a personal favorite of mine due to its absurdity). These guys know how to handle comedy and it really shows throughout the film. Speaking of handling comedy, Channing Tatum is given his first comedic role and, in my opinion, outshines all of the other “funny” actors in the film. Not to say that Hill or Ice Cube etc. fall flat, but I found myself laughing more at Tatum than the rest. One particularly funny scene comes when Tatum and Hill are forced to take the drugs they’ve been sent into the school to find. This leads to Hill giving an over the top performance as Peter Pan in drama and Tatum solving an interesting equation in front of an AP chemistry class. There are lots of laughs to be had in this film and there is a pretty good variety of humor. With most Jonah Hill movies you expect big parties (check), dirty jokes (check) and general awkwardness (check). But the script plays out as a parody of its source material and the film has a lot of fun poking at the fallacies of most cop shows. For example, there is a running gag of whether or not an explosion is going to happen during car chase sequences. For a guy who doesn’t really like to go see comedies, I laughed like I haven’t since “Bridesmaids.” Although “21 Jump Street” doesn’t really have that film’s originality, it’s a great modern adaptation of the 80’s show that launched Johnny Depp’s career.